LEXINGTON, Ky. (Oct. 1, 2018) — The GAME ON! team Step Up Challenge begins at 12:01 a.m., Saturday, Oct. 6. 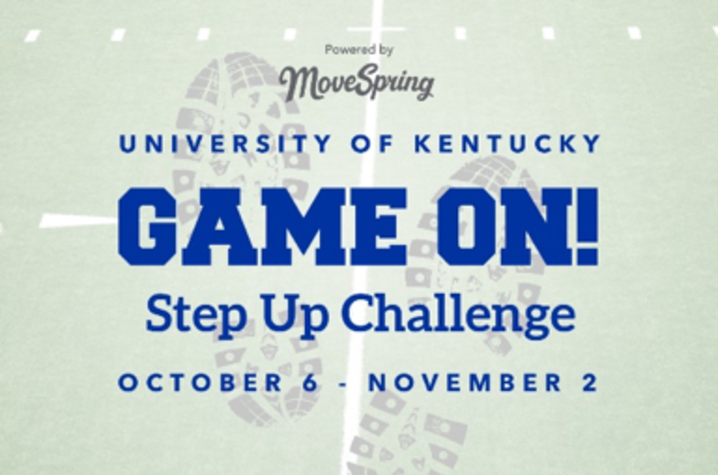 UK faculty, staff, retirees and spouses are eligible to participate in the four-week challenge, which ends on Friday, Nov. 2, at 11:59 p.m. Instead of individual goals, participants in this challenge will join their colleges or divisions to compete for the highest average team steps over the course of the challenge. Teams will be able to track their progress through leaderboards in the MoveSpring dashboard. The winning team will enjoy a catered tailgate party before the UK/MTSU football game Nov. 17, hosted by UK Health and Wellness. They will be able to bring family members or a guest and can share their secrets to success. To sign up, participants should log in to the UK Human Resources Health and Wellness dashboard. Registration is open now, and the deadline to sign up is Saturday, Oct. 13, one week after the start date. The earlier team members register, the more steps added to their totals. After signing up, individuals must assign themselves to the appropriate college or unit team. Syncing fitness devices each day ensures everyone’s steps count toward their team’s totals. For more information, visit the FAQ page. Participants can get a head start on their totals by participating in the Big Blue 4-Miler on Oct. 6 — an 8,000-step start. GAME ON!